A fantastically refreshing summer salad. 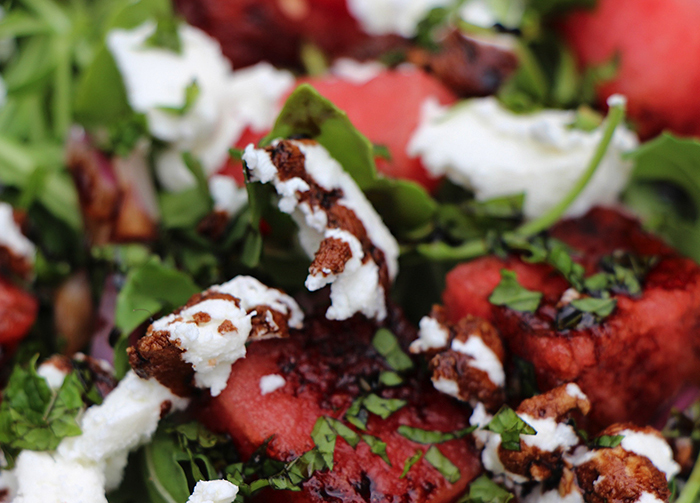 Sweet watermelon, tangy goat cheese, peppery arugula and cool mint all tempered by a balsamic reduction. This salad is a winner with anything you decide to cook on the grill. In a small sauce pan over a medium high heat add the vinegar and the sugar, stir to combine and bring to a boil. Let the vinegar reduce to a ¼ -1/3 of a cup, until thick and syrupy, about 8-10 minutes. Let cool slightly and pour into squeeze bottle. Place half of the arugula in a bowl or on a platter, generously scatter half of the melon, onion mint, goat cheese and drizzle with about half of the balsamic reduction. Repeat with remaining ingredients and drizzle with the balsamic reduction right before service.